Training the nuns in Buddhist philosophy and debate is not the only innovation at KGN. The nuns are now receiving education in the full range of ritual arts, including music, sacred dance, and sand mandala painting. All of these ritual arts are integral parts of the meditative practices that Tibetans have been performing since the beginning of Tibetan monasticism in the ninth century. Only now, through the innovation of KGN, the nuns have a far more profound understanding of the symbolic meaning of their rituals, and they have taken control of their own ritual life. They are no longer dependent on others to perform the aspects of Buddhist rituals that were once out of bound to women. Among the Tibetan arts, the one that has astonished and moved North American audiences wherever it has been performed and displayed is the art of sand mandala painting. (click to see larger image) A sand mandala is a two-dimensional geometric design, drawn in coloured sand, that represents the celestial palace of a particular emanation of the Buddha. In their ritual function mandalas are most commonly created in connection with a tantric "initiation," in which a practitioner receives the empowerment or permission to enter into the practice of a particular Buddha; this is carried out by the initiate symbolically gaining entrance into the mandala. From that point on the initiate becomes a devotee or practitioner of the path of that Buddha, and throughout their lives they will reproduce the mandala within the visualized sphere of their own imagination. The mandala now comes to represent the psycho-cosmic universe in which the Buddha carries out his or her spontaneous activity of leading all beings to happiness and peace through the emanation of unlimited love and compassion, and the pointing out of transcendent discriminating wisdom. The most requested sand mandalas have been those of the Compassion Buddha, Thousand-Armed Chenrezig, and of Medicine Buddha. See the products page for information on how you can order a sand mandala card. 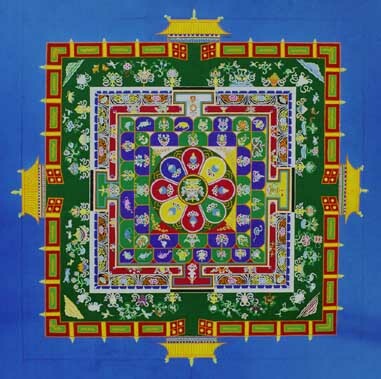 The Sand Mandala pages on the ArtNetwork site explain the construction and significance of Tibetan sand mandalas. Illustrated with colour photographs. 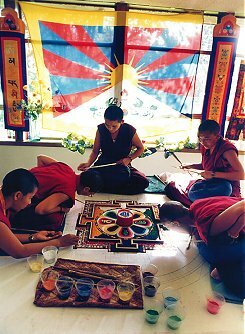 History in the Making: an article on the nuns of Keydong Thukche Choling, a sister nunnery in Kathmandu, who made a sand mandala during their visit to Trinity College in Hartford, CT in 1998. From the Hartford Advocate. Healing The Earth is an online exhibit based upon the 1997 visit of the monks of Drepung Loseling Monastery to the Canadian Museum of Civilization, showing their day-by-day construction of the Medicine Buddha sand mandala. The Center of the Circle: A Mandala Resource includes a large section of fascinating links on Tibetan sand mandalas.